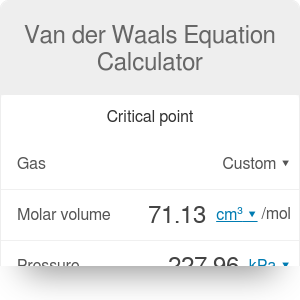 This van der Waals equation calculator is a handy tool that allows you to analyze physical properties of real gases. It uses the van der Waals equation, which is a thermodynamic equation of state that improves the ideal gas law. Have you ever wondered what is a real gas? Read on if you want to learn about the real gas definition and the real gas law. Do you need to analyze the gas state equation, but you don't know which one should you use? You have to choose the right theory: ideal gas vs real gases. In the following text, we have explained what is the difference between an ideal and a real gas. You will find out what are the advantages of using the van der Waals equation of state instead of an ideal gas equation. Van der Waals introduced two parameters (so-called van der Waals parameters), which are related to the critical point of gas, i.e., to the point at which it is impossible to distinguish between liquid and vapor (liquid and its vapor can coexist). In the text below, we have also written about the meaning of these constants and how can you estimate them. An ideal gas consists of a large number of randomly moving point particles, which can collide with each other and with the walls of the container. It is a so-called kinetic molecular theory, which we have described in our thermal energy calculator. You may also be interested in our particles velocity calculator, where you can find an average velocity of particles in gas in the given temperature. Molecules do not only collide with each other like in an ideal gas, but they can also attract each other within a distance of several molecule's radii. Because there are no gas particles behind the surface of the container, molecules near the surface are attracted into the material. As a result, the actual real gas pressure on the container walls is less than it would be in an ideal gas. Molecules are particles with a non-zero volume - not material points, like in an ideal gas. Therefore, the volume of a whole gas can't be less than a certain constant. where R is the gas constant R = 8.3144598 J / (mol * K). If the interaction between molecules (a = 0) and the size of the molecules (b = 0) can be neglected, i.e. if we can treat gas as the ideal gas, then the van der Waals equation of state passes into the ideal gas equation. Our van der Waals equation calculator is divided into two parts. First, you should specify the critical parameters of the considered gas to estimate van der Waals constants. You can change those constants directly in the advanced mode or choose one of the typical gases. a and b are van der Waals parameters (see previous section). Constant b value corresponds to the volume of one mole of the molecules (it is a correction for finite molecular size). Therefore, to avoid a situation where the volume of the molecules is greater than that of the whole gas, we must impose a condition V / n > b. The van der Waals equation is generally a very good approximation of the real gas state equation, especially for high pressures and under temperature and pressure conditions close to the gas condensation parameters. Van der Waals Equation Calculator can be embedded on your website to enrich the content you wrote and make it easier for your visitors to understand your message.